Guys, I created this infographics on what to say or not to say in front or about a deaf person. It has a Filipino (Tagalog) translation at the bottom of every item. This practically sums up my entire advocacy on deaf rights. You may freely download this. 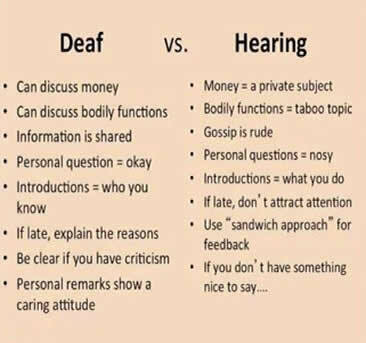 Please share this so that people may become aware on how to deal with deaf people. Cheers!!! Yesterday, three elderly deaf people trooped to MCCID College in San Mateo, Rizal from their home in Manila, roughly two-hour’s trip by local jeepney. Since our school is closed for summer, all of our students are on vacation. No one was minding the campus main gate so they simply entered the premises as if they are familiar with it. My uncle who was going out at that time saw them entering the campus. Once they saw him, they immediately “ranted” in sign language as if they were looking for trouble. My uncle looked surprised and panicked so he hastily escorted them to the dorm house where the faculty lives and called my attention. I am not that familiar with their faces but they knew me as an interpreter in a Baptist church. They introduced themselves, this time calmly, and explained their reason for sudden visit. They were looking for one deaf lady who is currently studying at MCCID. It was “extremely” important, based on their actions, that they need to meet her. I told them that the deaf lady already went home a week ago. She stayed in one of the rented houses outside the school. But her parents want her to stop schooling temporarily so she packed all her things and went home to their province in Central Luzon. They all looked very frustrated when I informed them about it. One of them was so angry that she started ranting that they wasted precious time and money coming here but got distressed because they did not see the deaf lady. To pacify her, I gently asked in sign language the reason why it’s necessary for them to meet her. One of her companion, a more elderly man, explained that they need to get the money she owes him. “200 pesos! (roughly 4 US dollars)” “Say what? Did I hear it right?” So I again clarified. “200 pesos!” I nearly fell off from where I stand. If we sum up all the expenses they incurred in traveling here, it would amount to more than three times that money! Again I inquired, “Was that all? Is that the total amount?” The other elderly deaf guy affirmed. He explained that he was very generous in helping other deaf who are needy so he proudly signs that they can freely loan money from him. I did not make any further questions about it because I might offend him although I was having difficulty hiding my giggle as to their purpose of coming here. So I just dismissed them by referring to my other deaf faculty Ervin and let him talk to them. They all ended up going home utterly disappointed. This situation reminded me of what I have experienced many times in the past. I’m not concluding that this is the norm in deaf culture nor just the Filipino deaf in particular. However, what I am saying is that this is not an isolated case. Many years ago, the manager of a local fast food restaurant called the school and requested me to go there because two deaf are violently arguing inside the place. I found out that the deaf lady owes the deaf guy money. The guy was courting the lady and he always pay for their “date”. But when she told him the shocking truth that she does not love him, the guy got so pissed off that he took his wallet, showed her ALL his restaurant bills from their past dates and forced her to pay for all of it. A couple more similar situations happened to other deaf which I need to mediate. When a deaf person owed money from another deaf, that amount is “carved in stone”, no matter how oddly small it is. One deaf who lacked money to pay for his fare asked his companion if he can borrow money. He promised to pay him next time. The deaf loaned him. But he kept on mentioning that over and over again to his face until he pays. The amount? Eight pesos (roughly 25 cents). I tell you, this situation is not uncommon. We can probably trace this into how they acquire their money. Since a sizable number of Filipino deaf have no work, they often rely on financial support from their family. However, Filipino families having a member who is a Person With Disability don’t usually allot a budget for them. So earning members of the family can only spare a small amount to support their deaf relative. Thus, the deaf tend to hold on tightly to whatever small amount they receive. As for the employed deaf, majority of them land in lower level positions like factory workers, clerks and rank and file government officers. Although quite a handful are in middle level positions, still most of them don’t have much money to use. Deaf senior citizens are no exception. Most of them rely on support from their adult children. The government also don’t offer much of a relief for them. Since deaf people are very mobile and communal by nature, they use up most of their finances from trips going to their deaf friends no matter how far they are. In our school, I often explain to them the value of money and how they should strive to earn for themselves. The main reason why they study is for them to be independent financially. They also need to control their use of a very limited money that they have. As more and more Filipino deaf earn for themselves, they are slowly moving away from being a “money miser”. In time, they will be able to share their blessings to others without overly thinking about anything in return.